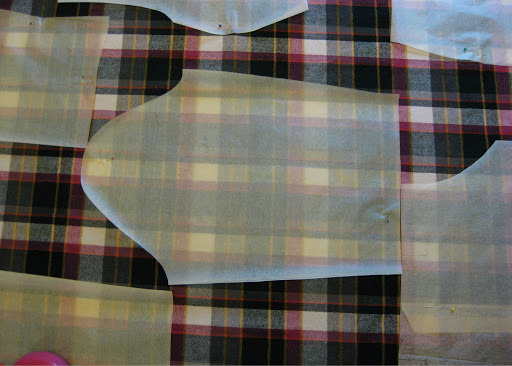 i had wanted to muslin and tweak and muslin again for my plaid dress, but time slowly got away from me so i had to streamline the process a bit. i had just picked up a copy of the palmer/pletsch “fit for real people” which goes to great lengths showing all sorts of possible fitting problems and how to tweak them out. now, you know when you have a rash or some weird ailment that you are just sure is a sign of something worse? then you google the heck out of it and come up with all sorts of possible deadly diseases and you’re convinced that you are officially knocking at death’s door? that’s kind of what this book does to you. it’s a little overwhelming and quite honestly, might be the cause of so many sewists over-fitting. not to discredit the info, but it can be a bit much. and lest the sewing gods strike me down right here and now, i should clarify: i’m all about making clothes that fit. in fact that’s what has fueled my sewing. i know i simply do not fit one size from top to bottom and unless it’s good quality RTW (i.e. the kind i can not afford), it’s difficult to make your own alterations. if i want a fitted dress, i’m gonna have to make it myself. but, i also need to remember to leave some breathing room and not reject a make simply because maybe i should have done this or that alteration. sometimes good enough really is good enough. at any rate, these gals came up with the whole “tissue fitting” idea, so i gave it a half hearted try. i don’t have a fitting buddy, and i’m not enrolled in any sewing classes, so an accurate tissue fitting is pretty difficult to do by myself. it did cue me in that perhaps my sleeve fitting problems are simply due to the dreaded “forward shoulder.” curse not having good posture all my life! thankfully, this is a super easy adjustment to make, and one i will be making from now on. after tissue fitting and making several flat pattern alterations, i made up an actual muslin. turns out (other than the forward shoulder thing) i made a few too many “fixes,” solvable by tracing out a new size. yes, tracing. cuz i do that now. 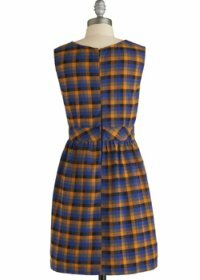 so, when i declared to all the interwebs that i was going to make a plaid dress and it was going to be awesome, that clearly came from someone who had never in fact done plaid. 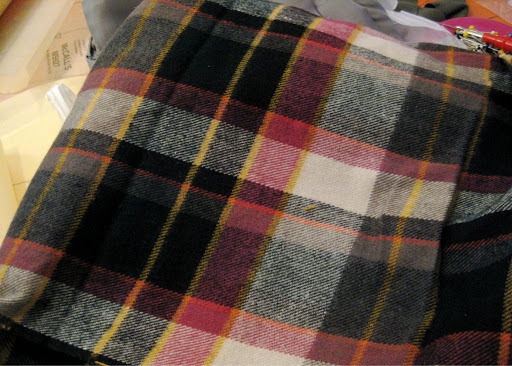 the envelopes always warn you to buy extra yardage for plaid-matching. did i heed the warning? no. no, i did not. in my defence, it’s in tiny print. i spent a full hour with my fabric on my dining room cutting table puzzling out how to arrange things when i finally traced off an extra copy of each pattern piece so i could arrange and cut the entire thing as one layer. 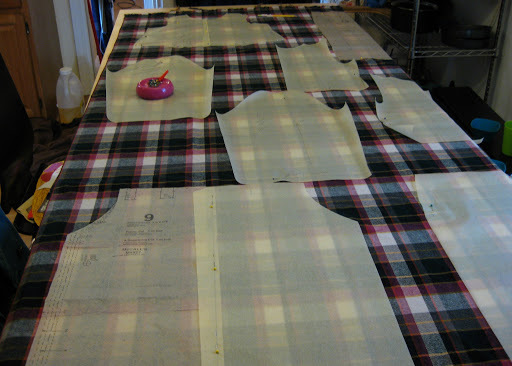 then i went back to the cutting table and spent another two or three hours arranging and matching plaids. i was determined to get this to work! ultimately i found a way with minimal compromise. initially i had the fat black stripe going down CF, but i shifted things slightly and really, it’s for the better. this is one of those uneven plaids so it isn’t symmetrical anyways. ultimately, that works out in my favor so it’s less obvious when something isn’t perfect. to make myself feel better, i kept referring back to some online pics with way less than perfect plaid matching. that they are selling for money. i would never in my life pay for such poor matching! sewing snob? guilty! things aren’t much better here either. look at that skirt! shameful. but really to top it all off, the twill weave of this fabric caused it to constantly pull off grain. not only were my pieces butted up against each other for cutting, but the whole thing kept shifting. i kept stretching and pulling, then quickly cutting my pieces before it twisted again. all in all, this dress was not the quick make i thought it would be. i had wanted to finish it before thanksgiving, but alas it was not to be. which was okay. i was able to put it aside and come back to it without a deadline. and… it might actually be finished now. and… it might actually be pretty awesome. but more on that later. i’ve been needing to add a few pieces to my oldest daughter’s wardrobe. whenever i bring home/receive in the mail new fabrics, the first thing out of my kids’ mouths is: “is it for me?? ?” the answer is usually no, so i have to appease my conscience by occasionaly making stuff for the ones who are constantly outgrowing their clothes. since anastasia is the first of three girls, she gets all the love (much to the chagrin of her younger sisters). once she outgrows the “mommy-mades” at least there are two standing in the wings to be the next recipient. the baby brother sometimes gets new makes, but since he’s the only boy i have a hard time bringing myself to make clothes that will only get a few month’s wear. anastasia already has loads of knit tops (of the old navy and target variety) so i picked up mccalls 6388 to make her something in a woven. i found this bright fabric on the clearance table at joanns for $1.50. stupid cheap! it’s from their “homespun” whatever line that hides out in the quilting section. maybe people quilt with this stuff, but all i see are visions of cute dresses and button down tops. the only design changes i made were to the sleeves. 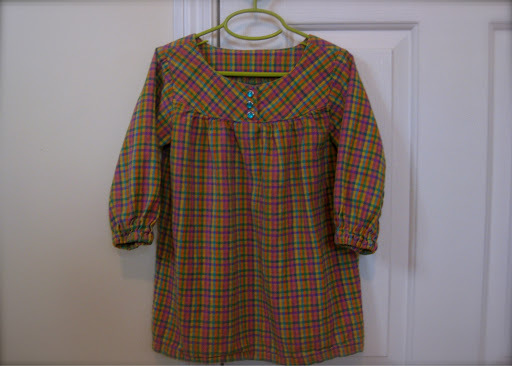 the pattern has a short sleeve with a gathered piece attached to make it long sleeve. i guess that’s cool, but given the bright rainbow-yness of the fabric, i decided to err on the side of not looking like a clown and simplified it. i adjusted the sleeve to be one piece, gathered at the cuff with elastic in a self fabric casing, and shortened to a 3/4 length (she adores the 3/4 sleeve). 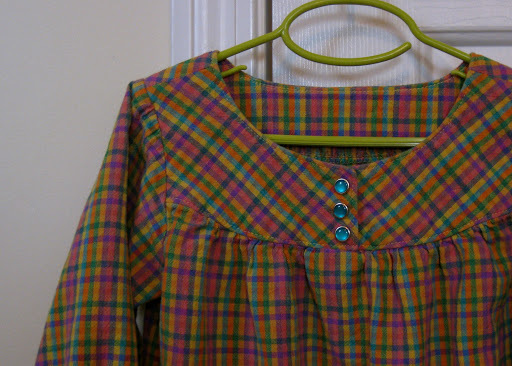 other cosmetic changes… i used snaps in place of buttons and cut the yoke portion on the bias for contrast (interfaced to retain shape). the inside yoke/facing i cut on the straight of grain since i didn’t need any stretching to happen. she loves this top and the roomy fit will make it so she doesn’t outgrow it in two weeks. i’m sure her next-in-line sister will have to pry it from her hands when the time comes. wishing my fellow usa people a wonderful thanksgiving! try not to get trampled on black friday, okay? kind of had to take a breather after finishing my coat. that was intense! of course by “breather” i mean make a few simple things that don’t require much thought. i’ll get to those soon, but i’m just too excited about my next project and wanted to share. i love plaid. maybe it’s my growing up in the grunge 90s that has solidified my love of all things plaid. i lived in oversized flannel button-downs (though why i ever thought XXL was “my size” will forever remain a mystery). 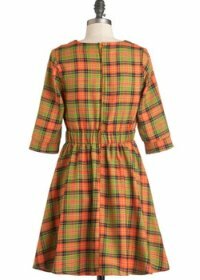 that said, i’ve wanted a plaid flannel dress for as long as i can remember. since i haven’t done much winter sewing ever… now is the time! like exposed bias binding with the raw edge left to fray slightly. i have to steal that idea. 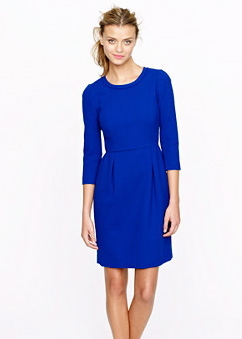 i did some online browsing and found this cute dress from j.crew. lo and behold i happen to have a nearly identical pattern in my stash (minus the weird dart at center front. who wants a CF dart?). i love the shape; it’s classic, modern, and versatile. and as it so happens, my birthday is *ahem* soon and what did i find in my mailbox, but a gift certificate to buy fabric! ah, my family knows me too well. hopefully this will be my holiday dress for the season. not that i have many holiday occasions (and none of them are fancy, hence the plaid flannel). but, well… do i really need an excuse? i thought not! i’ve also had that nagging in the back of my head about making a well-fitted sloper from which i can devise a myriad of patterns. again, now is the time! i am even choosing to do this dress with a 3/4 length sleeve. i realize that sleeve fitting may do me in, and there is a good chance i’ll ultimately abandon the notion of having sleeves, but gosh darn it i’m gonna try. the only other sleeved dress i’ve made for myself was my colette macaron and, admittedly, the sleeves don’t fit. i can barely raise my arms in that dress. harrumph. 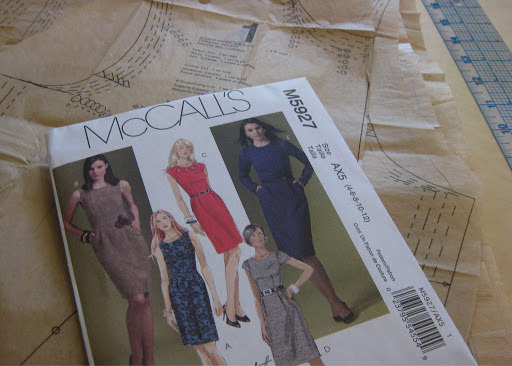 mccalls 5927 has mixed reviews over on pattern review, but that doesn’t really deter me. i plan to muslin it and hopefully walk away with something that fits. it’s a single dart bodice with a high neckline and sleeve; which should make this pattern an ideal starting point. as a bonus, this pattern is already drafted for different cup sizes. score! fitting the bodice shouldn’t be too challenging. 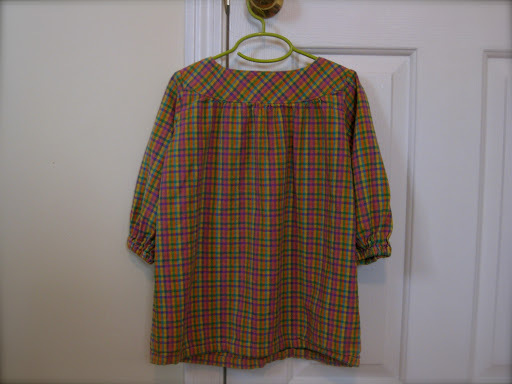 the sleeves… well let’s hope i can get that to work out. i’m super set on having a dress with sleeves. any brilliant thoughts on sleeve fitting in a woven? any holiday sewing plans for yourself or others? thanksgiving is only two weeks away!